The Claiming Crown Stakes Series was created by a partnership between the National Horsemen's Benevolent and Protective Association and the Thoroughbred Owners and Breeders Association. The goal was to create a Breeders' Cup of sorts for claimers and the "average" Thoroughbred owner. Claimers make up a huge market of the racing industry and is the home for many Thoroughbred owners. The Claiming Crown provides a great opportunity for claiming horses, their owners and trainers. The 20th running of the Claiming Crown will be held December 1, 2018 at Gulfstream Park Racing & Casino in Hallandale Beach, Florida. With full fields and attractive betting propositions, horses will come from all parts of the country to compete. The Claiming Crown marks the opening day program for Gulfstream Park. Opening day has drawn a total of 149 horses with 13.5 starters per race. The deep fields, filled with quality horses makes for some great betting races and opportunities to unlock fat payouts. Our handicapper has uncovered several live, playable long shots throughout the card. 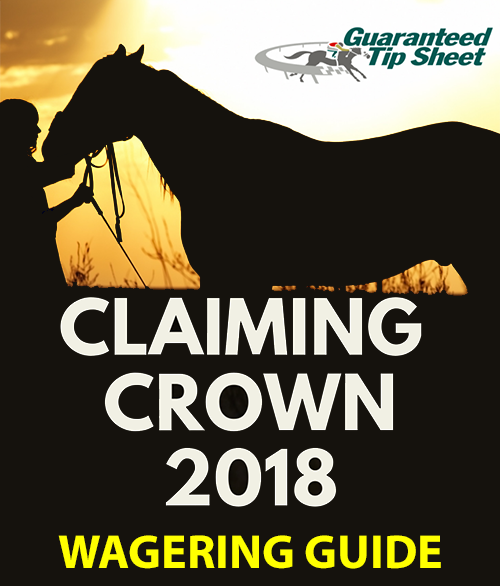 Our pro-subscribers benefit from a detailed review and insights for every Claiming Crown race in our Wagering Guide. #5 [ML 6-1] - Morning Buzz's trainer Saffie Joseph, Jr. wins at 30% with horses in their first race after being claimed. The six-year-old horse should settle right off the front runner(s) and look to strike coming out of the turn. #10 [ML 8-1] - Chunnel appears to prefer running on fast dirt. He's won eight of 18 races on fast dirt and has two wins in 38 tries on off dirt and turf. Trainer Jorge Vavarro wins non-graded stakes at 28%. #1 [ML 2-1] - Uno Mas Modelo put in the highest, last race speed rating for the field in his last at Churchill Downs, winning a $100,000 non-graded stakes race. Pace will be important for the five-year-old as he likes to race from middle of the pack and back. #3 [ML 3-1] - Cautious Giant has finished first (4x) and second (5x) in nine of his last 10 races with a third. He won his last and trainer Victor Barboza, Jr. follows a W with another W 22% of the time. In addition to analysis, the Wagering Guide details the likely pace of the race, the recent running styles of all the horses in the field, additional value and long shot plays, picks, suggested wagers and more. The Wagering Guide is filled with details that can make the difference when deciphering horse races with deep fields. Get our guide with any PRO monthly purchase. Good luck at the races, and hopefully you'll take advantage of the chances to cash in with high quality horse racing at Gulfstream Park on Saturday. GET TODAY'S GULFSTREAM PARK FULL CARD PICKS AND WAGERING GUIDE!